Matisse pieces with this particular hallmark date to a ten year period between 1954 and 1964 when the company, Renoir of California closed. 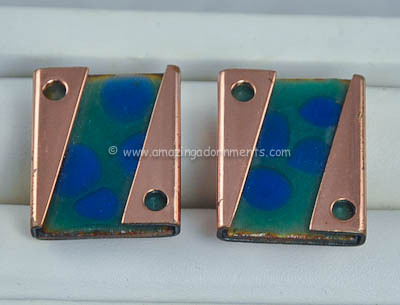 In keeping with their artistic style seen in other jewelry items, these cufflinks have a modern appeal. The enamel is green with blue. The hallmark appears on the shafts. Condition: Excellent vintage. Very light surface wear is noted. Measurements: Faces: 7/8" X 3/4".